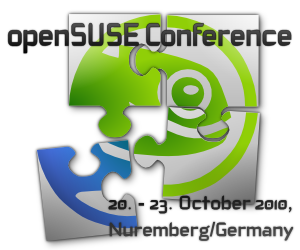 The openSUSE Project Team is happy to announce that the 2nd international openSUSE Conference will take place in Nuremberg, Germany between 20-23 October 2010. After the great success of the first conference last year we will again meet in Nuremberg to discuss, learn, plan and work on the openSUSE project with all its sub-projects as well as on general free software topics. The Conference Program Committee is currently seeking submissions from attendees for all kind of contributions to the conference such as talks, tutorials, hands-on-sessions and such. Suggested topics are around the motto of Collaboration Across Borders, but it is not a limitation. The Call for Papers gives some guidance and concrete examples. The deadline for this year’s Call for Papers is July, 31st 2010. Acceptance will be issued by August, 20th.